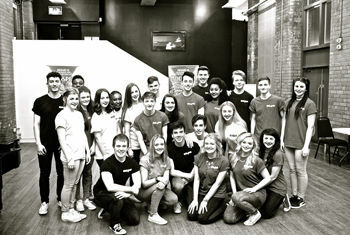 Following a nationwide search for the very best of local choral talent the producers for Godspell In Concert - the legendary rock musical from Stephen Schwartz, the Grammy® and Academy Award®-winning composer of Wicked - are delighted to announce that CAPA Voices have been offered the exciting opportunity to perform at St George’s Hall as part of the ensemble cast on Saturday 20 June. CAPA Voices will accompany a West End cast including X Factor star Andy Abraham, The Voice UK star Leanne Jarvis and Jersey Boys star Tom Senior. CAPA Voices are a group of enthusiastic and dedicated young singers selected by audition from students at CAPA College, one of the North of England’s leading Performing Arts establishments for 16-19 year olds. CAPA College combines full time vocational training in the arts with academic excellence. As well as appearing in several shows at the college and in theatres around Yorkshire, CAPA Voices have also performed at Olympia, London and in the Naumberg Bandshell in Central Park, New York. They are thrilled to have been selected to perform in the Godspell In Concert tour and are excited to perform on stage alongside professional musicians and vocalists. CAPA Voices will be coached to their moment in the spotlight by Musical Director Russell Scott who is at the helm of the show’s spectacular new orchestration. An accomplished singer, producer, musical and choral director, Russell is Chorus Director of Next Stage Choir and works regularly with choirs and ensembles. Under his tutelage they will sing some of the most popular songs from the show accompanied by the fantastic live Godspell In Concert band. The UK tour of Godspell In Concert will feature a brand new, modern-day rock score packed to the heavens with favourites such as Light of the World, All Good Gifts and Day by Day. This timeless tale of friendship, loyalty and love has touched the hearts of countless theatregoers all over the world - and now UK theatre fans can join in the celebration as a spectacular ensemble is set to stir souls and raise spirits, aided by a full live band. Godspell In Concert is at St George’s Hall on Saturday 20 June – 2.30pm and 7.30pm. Tickets are available from Bradford Theatres Box Office on 01274 432000 or visit bradford-theatres.co.uk for tickets and more information.